No doubt, traveling with the infants on a plane is one of the most difficult tasks. 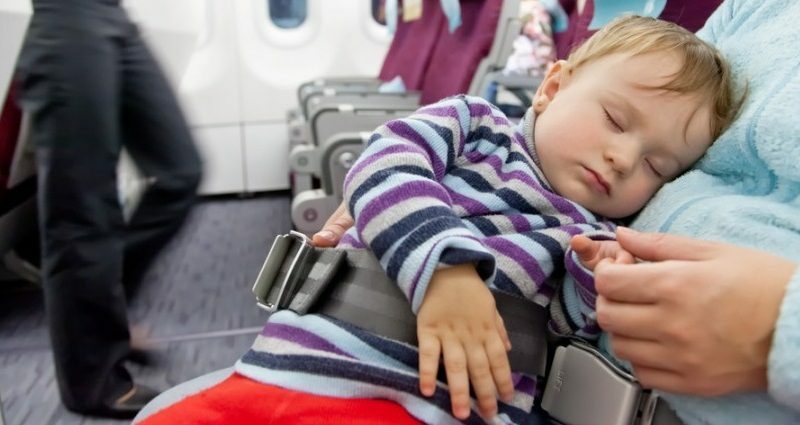 So to minimize your half of a headache, certain airlines offer its passengers some allowances and benefits too in case they are traveling with an infant, toddler or a newborn. Generally, the age limit attached it includes a baby less than 2 years. Talking about the best airlines which will make your traveling experience more convenient with your little ones are Emirates, British Airways, Etihad which are concluded as the best airlines to fly from the US to India. Emirates is one of the best international airlines for babies as it gives certain allowances regarding traveling with an infant. 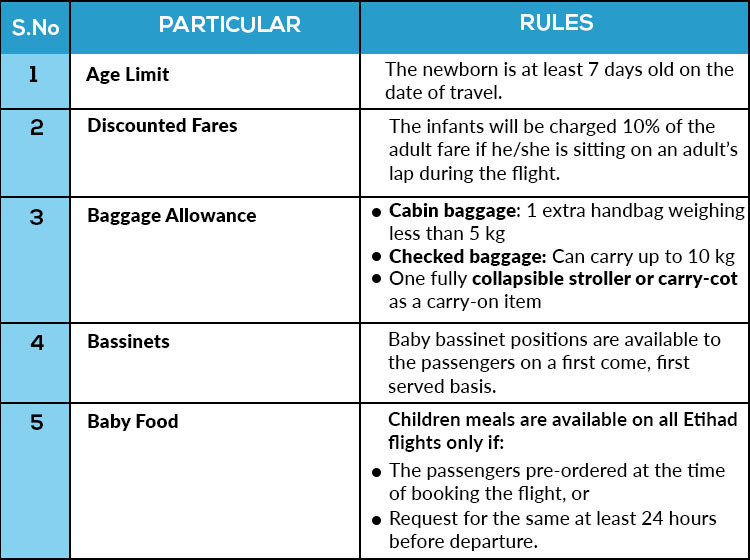 Following are the conditions under which the passengers traveling with the infants have to follow in order to enjoy the allowances. If you are traveling to India from the USA with the baby, then he/she must be under 2 years or 24 months so that he/she don’t need to purchase his/her own seat. The passenger needs to inform the airlines i.e. Emirates that you will be traveling with an infant on your lap. Anybody who is 2 years or older need to occupy its own seat while traveling on Emirates. If you are booking online, then you can request for a bassinet in the Passenger Details section. Children who are between 6 to 36 months are allowed to travel on board in the car seats but you need to purchase a separate seat for the child in that case. You can contact the airlines I.e. Emirates regarding purchasing of a seat for the infant. If you have the proper child restraint device, then you can also choose to purchase a seat for your infant. How Many Children Are Allowed As Lap Child? As per the rules, only one child is allowed as a lap child per adult. If you are traveling with more than one infant under the age of 2, then you need to book a seat for each additional infant. What Are The Amenities You Can Enjoy While Traveling With Infant? For the one who is traveling with the infants, Emirates is one of the best airlines to travel with infants as it offers a wide range of facilities. It includes pillows and blankets availability plus large overhead storage lockers. 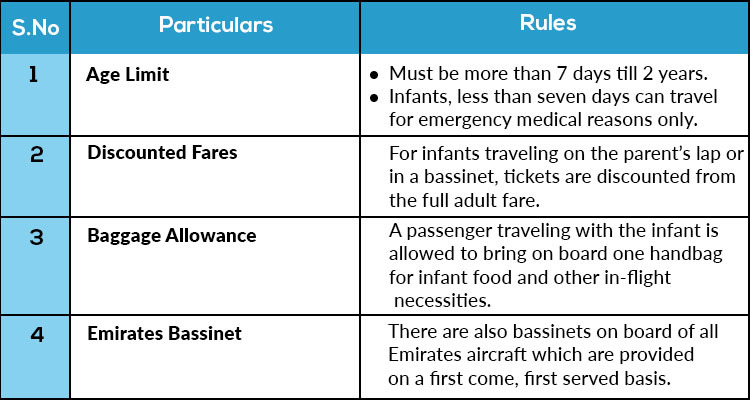 Emirates also offers bassinets on board all of their aircraft but these are available on a first come first serve basis. While traveling from the US to India, British Airways is one of the best airlines to travel to India from USA. One must be aware of the numerous rules and restrictions involved in traveling with an infant. It is also concluded as one of the best airlines to fly internationally with kids. 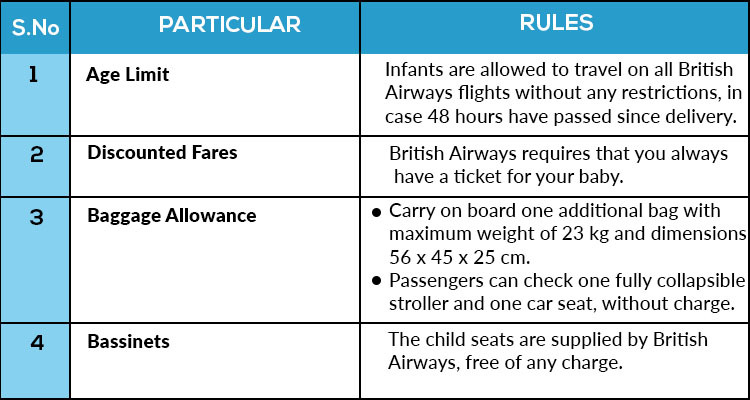 This involves the following points regarding the British Airways infant fare and other allowances. Only those children whose age is 2 years or less than 2 i.e. 24 months are not required to have their own seat. That means they don’t need to book or purchase tickets for the travel. The passengers need to inform the British Airways regarding his/her traveling with an infant on the lap in advance. The one who can hold the lap children must be at least of 15 years of age. This facility of lap child is available to only one infant per adult. In case, the adult or the passenger is traveling with more than one infant under the age of 2 years, then he/she needs to book a seat for each additional infant traveling with him/her. In case you have the proper child restraint device, you can purchase a seat for your infant. In case, you are traveling on a domestic flight and taking baby to India, then the child up to 2 years is usually charged 10% of an adult fare including the taxes. No matter, the infant will be on the lap of another passenger for the flight. Anyhow, if you want to purchase the seat for the infant between 6 and 23 months, then you need to pay for the ticket as per the child fare. This kind of tickets is not booked online so you need to contact the local British Airways office to do so. If you are booking tickets for an international flight, then also the allowances and fare are same for the child including the age limit too. There are different infant amenities linked to different aircraft. So check that better on the airplane page before booking a flight. Find the Infant Amenity Icon and click on it to know about the amenities on that airplane. If you aren’t able to see, then maybe that aircraft does not offer any infant service. The children whose age is up to two years or less than that are not required to have their own seat and they can easily travel as a lap child. As per the rules, only one lap child is allowed per adult. In case, the adult is traveling with more than one infant under the age of 2 years; then there is a need for booking a separate seat for each additional infant. You can also purchase a seat for your infant if you have the proper child restraint device. In case the child is up to or less than 2 years and he/she is sitting on an adult’s lap, then the airline usually charged 10% of an adult fare plus the taxes. While traveling through the Etihad Airways, passengers with an infant can enjoy numerous amenities like bassinets, changing facilities, Etihad infant meals which the passenger need to be requested at the time of reservation. Well, the Infant amenities vary by aircraft and you can easily get all the information regarding these on the airlines’ page in which you are traveling and conclude that which would be the best airline to fly internationally with baby and suits your preferences too.